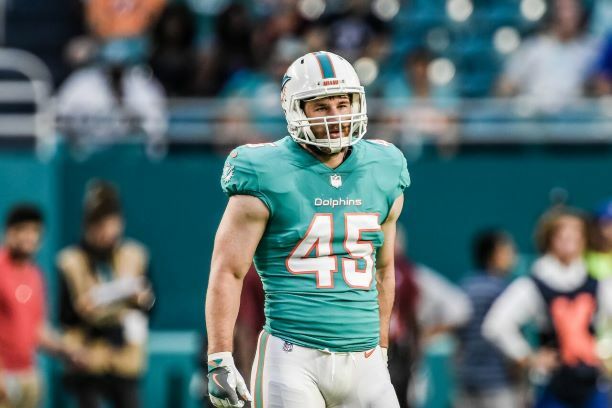 Without a doubt, football has always been a part of Miami Dolphins linebacker Mike Hull’s life. His father – Tom Hull – and uncle – John Hull – were both lettermen at Penn State with his father playing for two seasons in the NFL. Couple that with growing up in football-loving North Central Pennsylvania and it was a foregone conclusion that Hull would play the sport. He was a star running back and linebacker – as well as a standout on the wrestling, baseball, and track and field teams – at Canon-McMillan High School in Canonsburg, Pennsylvania. He would follow in the footsteps of his family and play for the Penn State Nittany Lions. While playing in State College, Hull would earn First Team All-Big Ten honors along with winning the Butkus–Fitzgerald Linebacker of the Year in 2014. 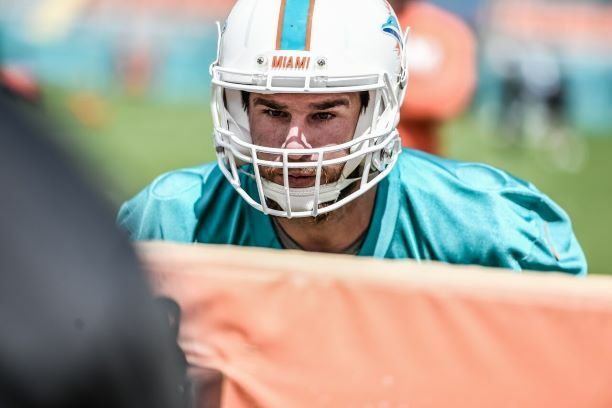 After going undrafted in 2015, Hull signed with the Dolphins and made his NFL debut that same season. 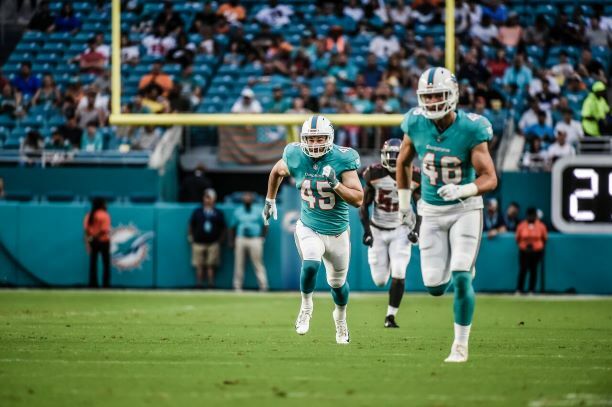 He has appeared in 35 games with the Fins, often as a special teams ace. Before all the stellar play at Penn State and in the NFL, Hull was a member of the inaugural U.S. National Football Team. Recently he spoke us to talk about his time with Team USA and how it impacted his career in football. EM: So, football is pretty much ‘in your blood,’ so to speak, but when did you first start playing and how long did it take for you to fall in love with the sport once you put the pads on? MH: Yeah, I started playing when I was a 9-year-old and my Dad and my Uncle were college football players and my Dad was lucky enough to play in the NFL too. So, playing football was always something that I wanted to do. I just loved the game from day one. Even when I was little, before I put the pads on, I was out in the backyard playing football with my older brother and his friends. Growing up where I did in Pennsylvania, this is one of the areas where football is kind of king. I had a lot of guys from this area to look up to, guys like Paul Posluszny, Sean Lee, and Ty Law. They were all from right around this area. Yeah, when you’re a kid here, you know the traditions and you play football. EM: When did you make the conversion full-time to linebacker? MH: Well, when I was younger, I thought I was going to be a running back. My first year of high school, I played both positions and ended up with 110 true tackles and I made some pretty good plays. It was around then that I decided I should do this permanently if I wanted to go as far as I could in my career. EM: When you go to a school like Penn State – especially for someone like you who plays linebacker – are you able to embrace all of the tradition and history of it while you’re playing, or do you wait until after you leave to appreciate it? MH: Well, when you go to a place like that that’s called ‘Linebacker U’ and has a history of great players at that position, you’re aware of it, but you don’t think about it in the moment. I mean the history is right there, guys like Paul Posluszny, Sean Lee, and NaVorro Bowman went there right before me. But, yeah, you don’t think about it then. Now I can look back on it and appreciate it and then you realize how cool it was. EM: So, let’s talk about Team USA. How did you learn about the team and the International Bowl that first year? Do you remember what you thought about those first practices when they got all of you together? MH: I believe it was the summer before my senior year. [Team representatives] reached out to me and my coaches and gave me a rundown of the International Bowl. I thought it would be a cool experience and I knew it was something I wanted to do. With those first practices, I thought it was awesome to be around other people who were top athletes. We had guys like A.J. Tarpley, Tyrann Mathieu. It was a fun week being around a bunch of top guys who were also really good teammates. If someone has an opportunity to play [for Team USA], I would highly recommend it. EM: What was it like putting on the Team USA uniform the first time? MH: It was definitely a great experience to be able to represent my country in some way. Football isn’t an Olympic sport, of course, so playing in this game for this team is the closest thing you can do to something like that. It’s also a great experience to be able to play against international competition at the high school level. EM: What do you remember about the game itself? Do you have any favorite memories? MH: I actually had an interception and a forced fumble in that game and won MVP. I just remember it being a really cool experience overall. Being able to make relationships with the guys that I did during that week, that’s really the best part of the experience for me. I think that’s the best part of any sport and I’m glad I got to have this experience when I did.